Since 1978, Fitzgerald Moving & Storage has been the most professional, commercial/office moving company in Baltimore, MD and the surrounding area. If you are moving to the Baltimore area or relocating elsewhere, we are the moving company that can be counted on to handle every detail of the journey. We handle every kind of industrial and commercial moves, drawing upon 40 years of knowledge and experience. From your initial call to us, we will take care of all the details from planning your journey, to the move itself and finally, our arrival at the new location. It is our goal to make your moving experience as worry-free as possible. We offer a wide range of services for your move, including professional packing. If you are in need of storage space, Fitzgerald Moving has clean, secure storage facilities for both short and long term use. 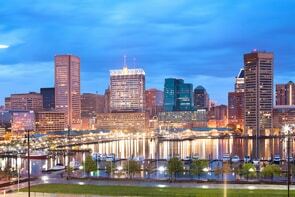 The great city of Baltimore was founded in 1851 and has a population of 611,000 residents. The overall metro area has over 2.7 million people who call the area home. Baltimore has something for everyone and is only 40 miles from our nation’s capital, Washington, D.C. The Star Spangled Banner was written in Baltimore by Francis Scott Key and other famous residents have included Edgar Allan Poe, Billie Holiday and Babe Ruth. The city is also known for having more public statues and monuments per captia than any other municipality in the nation. Our highly experienced office/commercial movers will see to it that you are settled in your new location as soon as possible. We understand the cost of down time as it relates to business operations, so it is our top priority to get your doors open at the new place of business. A big part of the success we have had over the past 40 years as an office and commercial mover is due to our dedication to customer service. Once your moving project has started, you will have a single contact person who will coordinate all of your needs in order to make the move as smooth as possible. If you are planning a move to the Baltimore area or anywhere else in Maryland, Virginia or Washington D.C., please contact us today or fill out our brief, online form for a free quote!